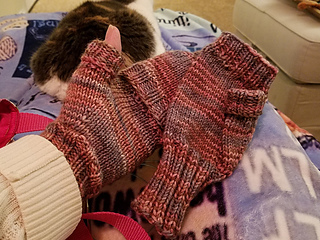 These are a very loose adaptation of a generic mitten pattern, knitted more tightly than I generally found in the patterns I was perusing online. 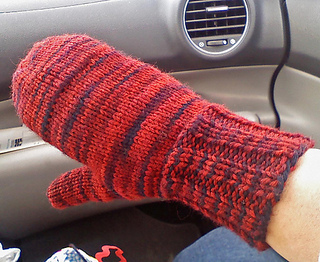 I added the flaps, because I like mittens with flaps! 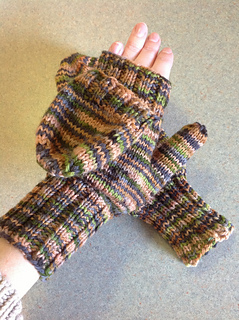 If you don’t want to do a gauge swatch, it’s fine by me…just try the things on as you go, and take notes as you knit (so the second one will match!). Knit one round plain (36 sts total). Knit one round plain (30 sts total). Knit one round plain (24 sts total). Knit one round plain (18 sts total). Knit one round plain (12 sts total). Knit one round plain (8 sts total). Graft or close like a hat. 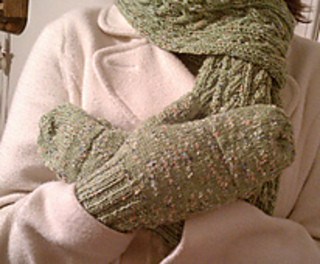 In December 2011, I added instructions for DK weight yarn. 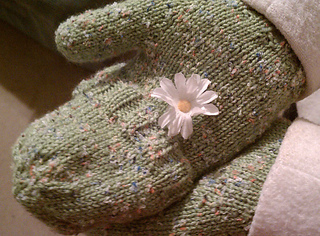 The green mitts are knit with the Snowflake Wool Blend, but any DK weight yarn will work! 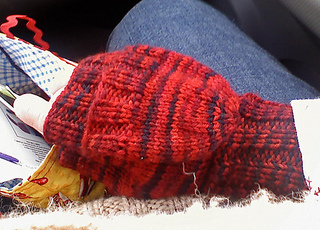 If you saved the pattern to your library before December 2011, please download the updated version to get these edits! Have fun, and Knit in Good Health!